Before you download any more apps to your phone...we have a warning about some apps that turn out to be much more expensive that you expect. Consumer reporter John Matarese shows what to watch for, so you stay safe and don't waste your money. Do you like to download cool new apps that friends tell you about? We have a warning about smartphone apps that appear to be harmless....But in reality can charge you hundreds of dollars a year. Like a lot of college students, Tori Hinkle is concerned about off campus safety....so she downloaded a personal safety app. "So you have a button you hold if someone is following you or something...." it was great until she checked her iTunes account. "It was a one time payment of 99 cents, and then it charged my apple id 20 bucks a month." Fellow student Alex Johnson got hit with the same thing with a guitar teaching app. It was 99 cents when i got it, and then a month later it showed up in my account as 14.99 out of nowhere." 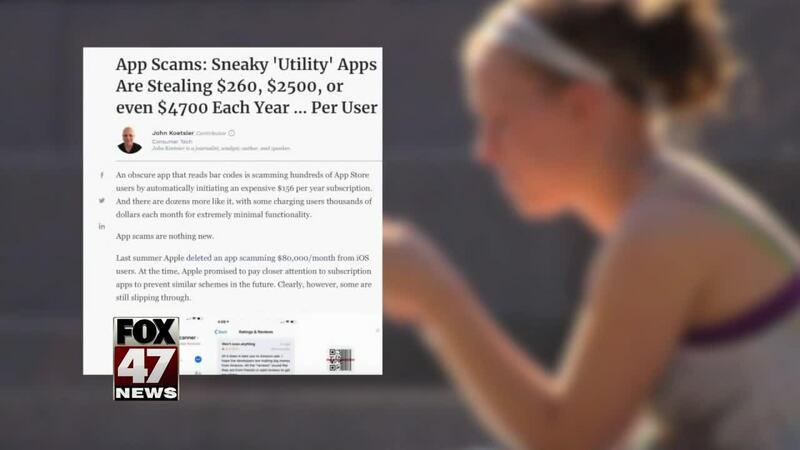 Now a new report in FORBES magazine calls these "app scams...." Apps that appear to cost a couple of bucks, but in the fine print say that they charge you every week or month! Tiny Lab's weather app: $260 a year. Color Call app: $520 a year....just to change your screen color when someone calls! The report says a lot of these apps start as free trials, where its free to download...but then after a week or two the app starts charging you and then charging you again. "It started charging me 10 dollars a month....when i signed up it said it was completely free." Kaitlyn Thompson says it happened to her with a free music service. So how can you protect yourself? Don't just trust app reviews in the app store....as FORBES say many are fake. Google for independent reviews, or just don't download questionable apps. FORBES says a few apps charged over a thousand dollars a year...but says apple fortunately has taken those down. Bottom line: don't assume the app store has checked every app for long term costs....so you don't waste your money.